Secondly I was born in Yorkshire (Harrogate to be exact) so it would be like a home coming of sorts. Race preparation went well even through our lovely snowy winter months where you just chucked on the off road shoes and out you went. This with Stafford half and a Sexarathon race showed my form was ok. I had done a recce of the route with a friend at Easter but the weather was horrendous and it was freezing at the top of each mountain. I was very much hoping that was to change. On the day we were greeted to beautiful sunshine if not a little chilly. As you turn up on the day you realise this is a prestigious event in the calendar as you collect your race number and dibber. Lots of great runners about including Ricky Lightfoot and Nicky Spinks who I had recently had the pleasure of seeing at talks in Shrewsbury. Once shown what to do with the dibber (this is used at various points on the course so to identify where you had reached and what time it took to each check point) it was off to get your kit prepared. As in all Fell races a kit check was done so no kit meant no race. We were all advised of the cut off times for each check point and then they announced some of the runners, the ladies winner from last year & 7 previous men’s winners. Deb Millington was also doing the event but I never saw her at the start due to the number of runners. Would I ever see her? 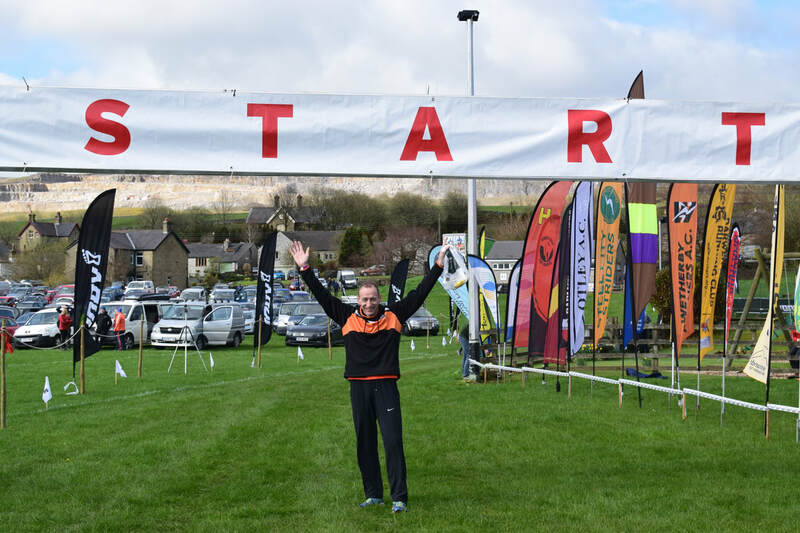 The course starts and finishes in Horton in ribblesdale. A popular village for Walkers to start their traverse of the Yorkshire three peaks challenge. Up and down Pen-y-ghent and over to ribblehead viaduct was the first leg. A splendid sight to see if there ever was one. This was approx 10.5 Miles covered. 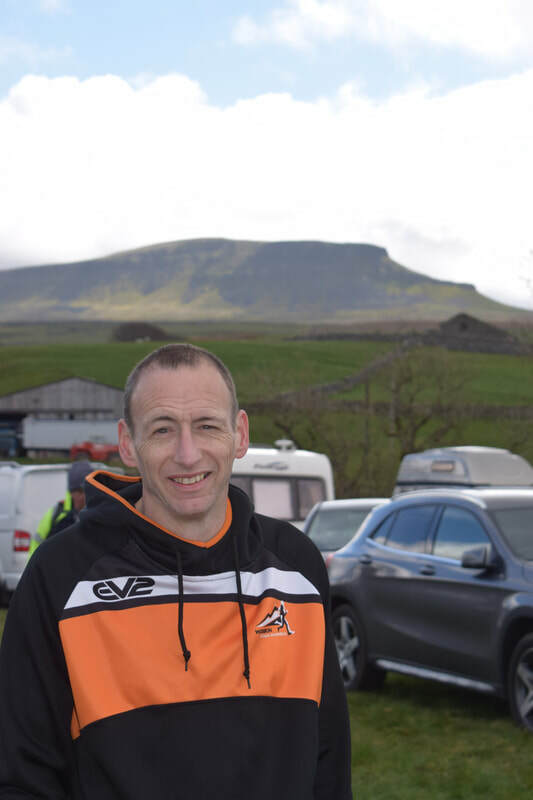 During this leg I went past Deb up Pen-y-ghent only for her to pass me near Ribblehead where she kindly offered me morale support and a mini mars bar to help the struggle. I never saw her again as she glided away in the distance. Next we went up Whernside which seemed to be covered by moss and was so wet and soggy it felt like you were standing on sponges. A lot of this was on hands and feet as it was so steep you could hardly walk it. From the top you dropped down into the valley and over Ingleborough, the views were superb if you had the presence to look around you. The final climb to Ingleborough was another hands and feet climb but at least you knew it was downhill from the top. The race didn’t go to plan for me as at 8 miles in I didn’t feel great but struggled on. Many a moment I questioned myself on if I should carry on, I would sit down to admire the views and the other runners following me up the mountain. Even though I did eat I went light headed as we went up Ingleborough but was determined to carry on. To add insult to injury I had cramp in both legs on and off from 16 miles so a real tail of whoah. On to the finish and what a relief it felt to get there, it was all over. The pain. the pleasure, the exhaustion, the views and the happiness on completing what for me was my toughest race ever. I stayed to watch the presentation while we ate the free food and a can of special commemorative beer. ​As I watched the presentation I now see where things are against me as all the winners were at least 6 foot plus tall. Long strides up and down the hill is the answer. Not much good with my Jack Russell like frame . This year the Men’s time was 2.49hrs and the Womens was 3.17hrs. When I finished I vowed never to return as it was so tough but a few days in here I am considering taking on the challenge next year. Surely it can’t be as bad as this year! Can it? ​Now that the training and marathon were out of the way I decided that I wanted to do something different. So after only doing 2 runs on the Wrekin with club on a Thursday night and really enjoying them I saw the advert for Cannock Chase Trail Half Marathon on Facebook, a completely new event for 2018, with entries only limited to 400. Before I committed myself I needed to check a couple of things with the organisers – would there be a cut off time? And would the course be signposted as I am what you call ‘navigationally challenged’? The answers were no cut off time and the course would be fully signposted and taped off so I would be fine! ​As per the great British weather it rained the whole day before the day of the race so I’d already prepared myself for it being very muddy and slippy, the surface being described as trail and 100% off road. The start was at the Tackeroo Campsite, with free parking and toilet facilities about 100 meters from the start. Now, if I described the course it would go along the lines of….trees, downhill, uphill, uphill some more, mud, more mud, trees and more trees so to take the description of the course off the website: The start / arena area is based at the Tackeroo Campsite in the heart of Cannock Chase. The course based on a figure of 8 which makes it ideal for spectators as from the arena they will get to see you at the start, after 1 mile, 3miles, again after 10miles and then at the finish. The route is on mainly rolling terrain, hard stone tracks with a few single-track sections that add an extra bit of fun to the course. We recommend trail shoes as the surface is un-even and could be muddy in sections. From the beginning you head out of the arena into the trees and loop around and back into the arena before heading down into the valley on a mile long single-track fun section. From the bottom of the valley to head along a steady climb back up into the arena. At this point you’ll find the first feed point. Now you head out in the opposite direction where the course flattens out for a few miles. You’ll zig zag through some dense wooded areas before heading back into a valley. Now you’re faced with a long steady climb back up on the top of the ridge bringing you to the half way point. Again the course flattens out before heading into another valley and an area called Brindley Heath. A really picturesque section of the course, you run along the valley with a stream and heathland to your right and wooded area to the right. Now you’re heading back toward the arena at which you come to at the 10mile point. You can pick up encouragement from spectators before heading off on a final loop around the arena that includes more fun single track. I really enjoyed it; despite the hills (anyone who knows me knows I dislike hills!). I didn’t put any pressure on myself to finish in a certain time and just wanted to enjoy it. When I crossed the finish line my watch said 12.5 miles and after checking with others they had all got the same. This has been fed back to the organisers on their Facebook page. I was also pleased to see from the comments that a lot of others had thought the course was tough, so it wasn’t just me! The medal that we received was made out of wood, rather than metal, which the organisers said was more in keeping with the event. So a different race and a different medal for me. Overall, it was a great event. Well organised and a brilliant course. Would I do it again? Yes definitely! ​Ok so I think this is my 4th time at this event and could only encourage, last minute, one of the Bffs. Kelly Marie Jones. I like the event as I have PB'd twice on this course and I enjoy the spectator-ship. We had arranged transport with another running buddy Bernie and off we go. Good thing about Stafford is you can park quite close to the start/finish area for free and there's usually a few of us and we meet up in McDonalds. There are portaloos but I'm sure MaccyD's don't mind as most buy a coffee etc. After a little chat it's then all about the group photo outside McDonalds. 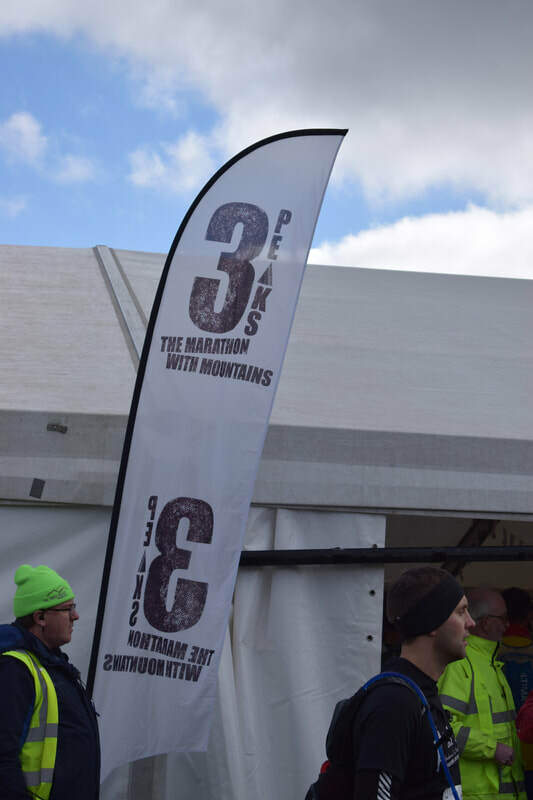 (Other burger bars may be available; I'm partial to a falafel burger myself) We picked up our Tees as the finish area can be a bit congested at the end. First time I've used the bag drop inside a theatre and it was very easy and there were more loos inside. By that time it was time to walk the short way to the start line. This is the bit I don't enjoy and this year was no different. Because it's in the shopping area it's quite narrow for the amount of runners, and I'm not sure why but spectators also... therefore we started a little further back than we would have liked. Anyhow we heard the gun go, a quick convo about our pace and off we go, I'm following Kelly as I know I'm not as fast as her, we are weaving in and out trying to up our pace when Kelly shouts "go over to the path" for some reason I didn't and I thought that will be the last I see of Kelly until I meet her at the end, until bang, crash, wallop! She has somehow run into a bollard!! All runners and spectators immediately around her gasp. I stopped and said a few swear words. I honestly thought she was out. Laura and Cherokee were watching on so I presumed she go over to them. I carried on and thought maybe I should have stayed thinking maybe she broke her leg when she caught me up!!!! Fair play to Kelly, she’s made of strong stuff. Only another few minutes had passed and I could see even after a run in with a metal post Kelly was looking strong, I assured her she didn't need to wait for me and that definitely was the last I saw of her until the bag pick up. I was pleased to see her smiling. "The first mile I did but after that no I would have liked a better time but please with what I got after what I did I was going to stop right then because my leg and knee was throbbing "
I was sure there'd be video footage... there is but luckily only of Kelly checking out her knee and me looking confused and not swearing like a fisherman's wife!! I wouldn't say this is the most scenic of routes, very little is on tracks, it’s the crowds that are the draw. It's well organised with a good medal and t-shirt. After an eventful run of weather during my training I was so happy to open the curtains on marathon morning to see perfect running conditions. No rain & more importantly no snow in sight. I missed getting to the club photo location in time as wanted to get my bag stowed away and have that all important last minute nervous wee, but thankfully on passing to get to the race start all the relay teams were still there. I had missed my fellow marathon runners. It was great to see them all and a couple of last minute hugs and a few photos was the final boost I needed. I was ready to go! I decided to break the run down into 4 parts, the 4 legs of the relay race. This gave me different things to focus on each time & I hoped to see the smiling Wrekin faces at the end of each one. I also decided to stick with the 4hr pacer - fingers crossed this would be for the whole marathon. The first 19 miles were perfect with spot on pacing and I was still with the official pacer. Only 7 miles to go, just a club run with Mick I told myself but alas this then start to slip and he (the pacer not Mick) started to drift away. But I wasn't giving up as a PB was still possible. The words 'Only the equivalent of a park run to go' were then uttered, including by Martyn Bidgood as he flew past on his leg of the relay. I just needed to keep going. Finally the sight we all wanted ... the finish line. Yippee!!! And double yippee for that marathon PB I achieved. Chuffed was not the word - 3 years on that course and I finished with a time that I am more than proud of. At last my determination or stubbornness had paid off. Will I be back next year to attempt a sub 4hr again, no but am tempted with the relay team. Will I be back in Manchester in 2020 for another sub 4hr attempt - hell yes!! This run has taught me that I can definitely do this time and I will be going out to get it. Watch this space. Submitted By ​Leg 1 Julie Spriggs, Leg 2 Marie Thompson, Leg 3 Jane Kind, Leg 4 Julie Hartland. 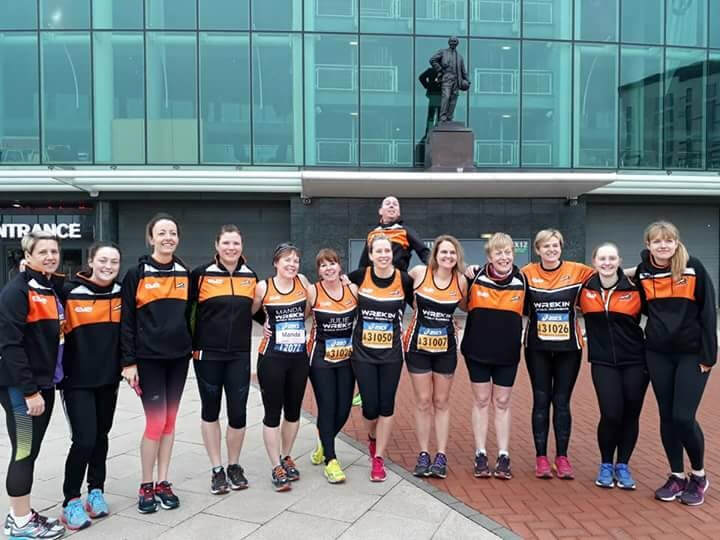 After spectating in Manchester for the past 4 years, which is very stressful I can tell you, a group of us decided to put a relay team or two together for this year. After putting a post on our Facebook page we managed cobble together 4 teams. We all met at the Manchester United Old Trafford for team photos and to hand over kit to each other. Paul Spriggs, Cherie Rudd, Becky Owen Jones and I headed for the start which was 30 minutes after the main marathon start. bionic suit which would take her almost a week to complete. The starter gun went off and frightened us half to death and we were off. The first leg (9K) of the relays is very quiet, lots of fabulous marshals cheering us on around a quiet housing estate but once we made our way back into the center the spectators were more apparent. It wasn't too long before we heard Sammi Clements, Kerry Williams and Helen Leonard cheering us on. As we ran we caught up with lots of the back markers of the marathon and even a pacer group!!! Cherie and Becky dragged me round saying "Is this too fast for you?" to which I replied "yes!!!! ", made no difference, on they pushed. The atmosphere was great with lots of music and bands playing keeping everyone going, as we crossed a bridge over the River Mersey we saw the sign for our relay finish, yay! We ran in and I handed the next leg over to Marie Thompson. I thoroughly enjoyed it and will be doing it again. Following on from our team photos those doing the first leg headed over to the start line while the rest of us headed to the tram stop to get to our starting positions. Darren Owen-Jones, Louise Stevens and Gayle Stevens and Myself got off at Dane Road for a short walk to the start of leg 2 and waited for the others to hand over the baton. At first it all appeared very calm and quiet we were given instruction that when we met our team mate we were to run with them over the timing line and then carry out as they stopped. We were hidden behind a corner when Cherie, Julie and Becky took us off guard and we all suddenly started running together then the rush began. 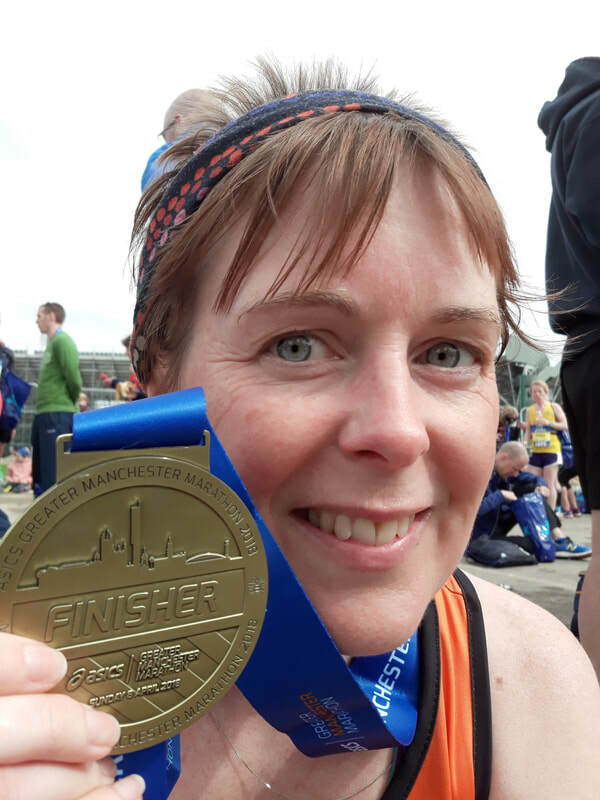 There was such high spirits throughout, the music the atmosphere the sing along from the marathons runner it was fantastic but I was thinking while running I'm glad I'm only doing 9K couldn't have done the whole thing which kept me pushing to pass on the Jane Kind. Due to the panics with the first handover I was expecting the same with the next so when I arrived to pass on to Jane I was surprised she was just stood then still with jacket on not ready only to be told id already gone over the timing line and the time would start again when she went back over, had me totally confused. Thoroughly enjoyed it! We had a bit of a late night before the race stopping up nattering with my roomies and toasting our team name ‘prosecco lovers’ with naturally a little drop of prosecco! That being said our focus the next day wasn’t tainted, however trying to work out whose kit bag we were passing onto who was proving a little taxing to say the least. Anyway, I ended up wearing Marie’s jacket with the view of her wearing it when we swapped over. I waited for Marie to come in and watched other team members enter transition and receive a raucous applause by everyone else waiting. It was such an overwhelming sense of running unity. Everything was really relaxed and handovers were smooth and orderly. Soon my team mate Marie flew around the corner like a gazelle into transition and due to the mixed instructions on previous handovers she bellowed at me ‘Goooooooo’ obviously surprised to see how laid back I was over starting my run out. ‘Clock starts when you cross the pad’ obviously wasn’t the message given to all. So off I plodded to run my 13k at a point in the race where other runners were really starting to feel the intensity of a marathon distance. Due to my fresh legs I felt a bit guilty passing by people who were struggling at the 18mile mark so I made sure to give a few words of support to those flagging. You couldn’t fail to miss the support given by Jenny Harrower and the noise from that cow bell still makes me chuckle. The confusion continued with the signs being a bit misleading that at one point I thought I had missed transition for leg 4 runner. I soon worked out where I needed to handover to Julie after checking with a marshal that I hadn't passed it. Enjoyed every second of it and would do it again. What a fantastic event. This was my first race for over 18 months, due to injury and I had forgotten how amazing it was to race. Kris, Martyn, Megan and I headed off to our start point on the metro, bit of a bonus as all runners travel for free which takes away the headache of change bouncing around in your pockets. We had a lengthy walk to our start point, but it was a beautiful sunny morning and we chatted all the way there. Our team was the first to arrive, shortly followed by one other who was keen to get ready to start, and was taking his trousers and top off not long after arriving; he was part of the winning team. There was a little supermarket 5 minutes walk away and we called in to get Costa coffee, which hit the spot. Our start point was at a school and we could use the toilets and if it had been raining we could have sheltered in the sports hall. Jane Kind handed over to me and I was away, it was warm and sunny and I set off felling very guilty passing the Marathon runners, at this stage they would have had very tired legs as we set off at about mile 19. I gave words of encouragement as I passed people and had a chat to many.Support along the course was amazing, so lovely to Allison & Dave Haycox cheering at mile 25, I needed that, Thank You. Beautiful medal and T shirt. It was so lovely at the end when I had collected my goody bag and saw all Orange and Black Wrekin Road Runners waiting, love you guys. Great team event and weekend away. I will definitely do this again.